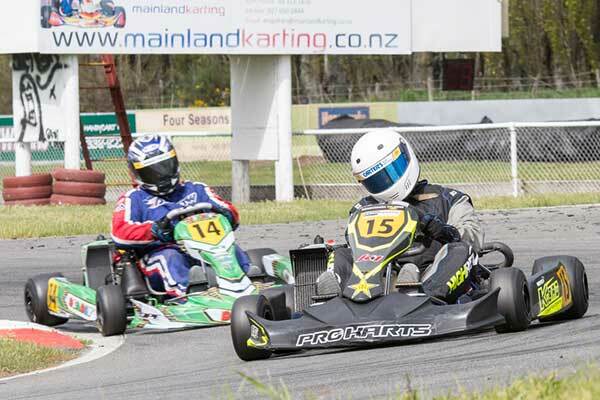 Kevin Barker and Ollie Workman spearheaded a late Nelson charge as the KartSport Canterbury club’s Garden City Communications-sponsored Garden City Championship meeting hosted the final round of this year’s Mainland Series in Christchurch over the September 30/October 01 weekend. 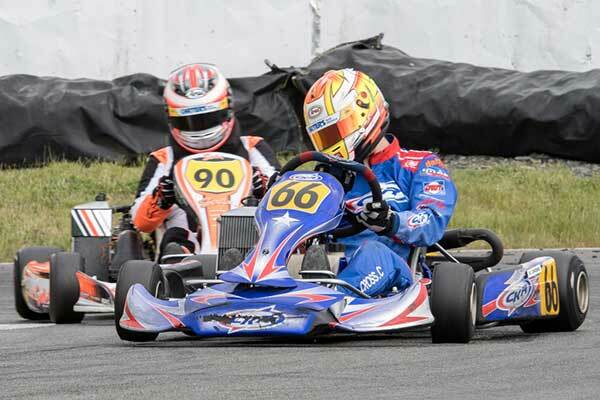 Both drivers claimed Finals wins at the meeting, Barker – the President of the KartSport Nelson club – on both days in Rotax Heavy, young gun Workman on Saturday in Cadet ROK. 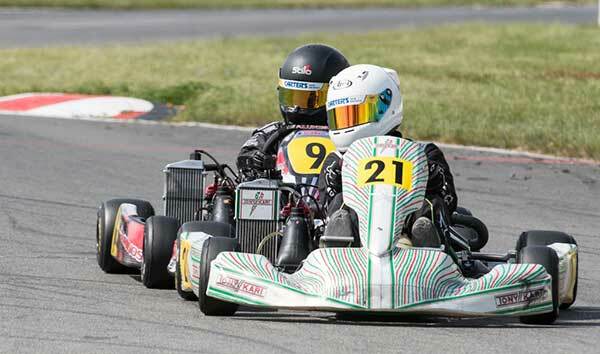 The results cemented the position of the two drivers in the Mainland Series and helped KartSport Nelson turn the tables on the host club, KartSport Canterbury, in the new Interclub title chase. Barker (Rotax Heavy) and Workman (Cadet ROK) were two of six Mainland Series title winners crowned at the meeting. 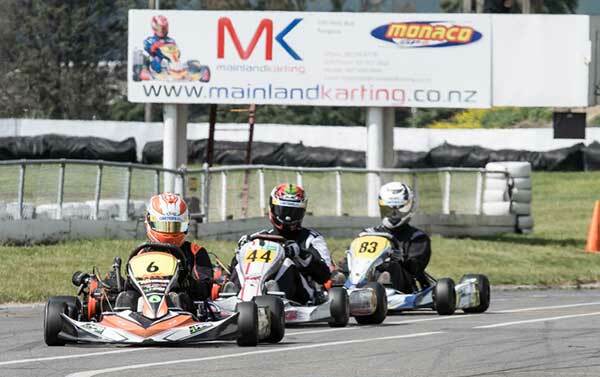 The others were Liam Pink (Vortex Mini ROK), Zac Christensen (Rotax Junior), Jarred Cleghorn (Rotax Light) and Nathan Clive (Briggs LO206), all from Christchurch. The KartSport Westland club also got also got a look-in courtesy ‘Coaster Andy Downs who, in finishing second to Kevin Barker in Rotax Heavy, won the Masters award. The well-supported Garden City title meeting proved a true test of driver and kart over the two days with racing run in the usual (anti-clockwise) direction round the Carrs Rd track on Saturday, then in the reverse direction on Sunday. Top Christchurch driver Caleb Cross was the dominant figure in the Rotax Light class, winning the Final on both days, on the first from Thomas Emmerson and Kieran Woods, and on the second from Chris Cox and Woods. Liam Pink from Christchurch was also a dual finals winner, in his case in the Vortex Mini ROK class, with KartSport Dunedin clubmates Jaxon Harvey and James Black close behind. It was also close in Junior Rotax where Zachari Christensen won both finals, from fellow local Adam Godwin. 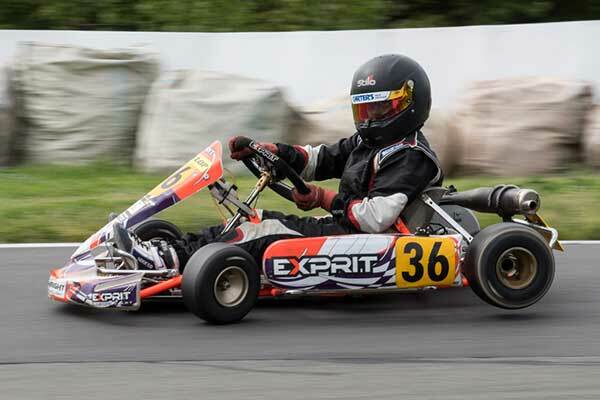 Experienced young kart and car ace Bailey Paterson, meanwhile, dominated the Briggs LO206 class, winning the finals on both days from Mike Knight. 1. Ollie Workman; 2. Jacob Earley; 3. Lochiel McGregor; 4. Sam Knight; 5. Kohen Thompson; 6. Carter Baxter. 1. Lochiel McGregor; 2. Jacob Earley; 3. Sam Knight; 4. Kohen Thompson; 5. Izaak Fletcher; 6. Maia Nicholson. 1. Caleb Cross; 2. Chris Cox; 3. Kieran Woods; 4. Thomas Emmerson; 5. Jack McLaren; 6. Cameron Hay. 1. Liam Pink; 2. James Black; 3. Jaxon Harvey; 4. Alex Crosbie; 5. Blake Knowles; 6. Samuel Cayford. 1. Kevin Barker; 2. Andrew Downs; 3. Daryl Wehner; 4. Sam O’Malley; 5. Ian Carter; 6. Kyle Hollingworth. 1. Kevin Barker; 2. Andrew Downs; 3. Daryl Wehner; 4. Mark Ahlfeld; 5. Sam O’Malley; 6. Kyle Hollingworth. 1. Zachari Christensen; 2. Adam Godwin; 3. Logan Thompson; 4. Kohen Muir-Thomson; 5. Dominic Robertson; 6. Jack Cayford. 1. Zachari Christensen; 2. Adam Godwin; 3. Kohen Muir-Thomson; 4. Dominic Robertson; 5. Oscar Noble-Adams; 6. Jack Cayford. 1. Bailey Paterson; 2. Mike Knight; 3. Nathan Clive; 4. Adam Geary; 5. Stephen Topliss; 6. Derryn French. 1. Bailey Paterson; 2. Mike Knight; 3. Stephen Topliss; 4. Derryn French; 5. Nathan Clive.